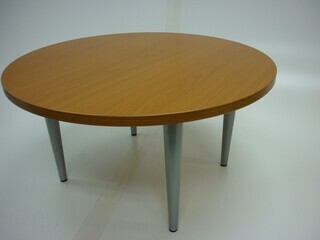 Selection of circular meeting tables. Picture is an example, may be supplied with different legs. 1000mm diameter beech x 2 - £75+VAT each. 1200mm diameter oak x 1 - £85+VAT each. 1200mm diameter maple x 8 - £85+VAT each. 1200mm diameter light oak x 3 - £85+VAT each.